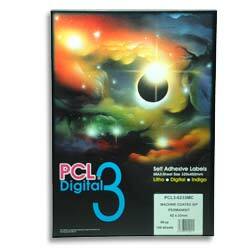 Specifically designed for maximum stability and simplicity of use, PCL3 Digital® SRA3 labels are based on the highly versatile and successful PCL™ (A4) format. Two A4 panels of labels are positioned on an SRA3 sheet with extra grip edges all around and a central gutter between. To help with positioning for guillotining for final presentation, crop marks are cut into the label surface to mark the position of the A4 sheet edges. This SRA3 range of sheets and die cut labels is equally at home on Indigo, Digital, Litho presses and hot fusing Laser toner printers. Two A4 panels of labels are positioned on an SRA3 sheet with extra grip edges all round and a central gutter between.